When you have more “stuff” than you do space, you need storage! People store items for all sorts of reasons, from downsizing to a smaller home to completing home renovations. Whatever the reason, when you have to store your furniture or other belongings, you need to find appropriate storage space. The type of storage space you require is dictated by a variety of factors including the monetary and sentimental value of the belongings and how often you want to access them. At All Jersey Moving & Storage, we understand all the considerations that go into selecting not only the right moving company, but the best storage space for your specific needs. There are a number of reasons you may require storage when moving to a new home. Home Staging. In a competitive market, presenting your home for sale often requires home staging. To stage your home, you will have to remove some or all of your furniture and personal belongings and place them temporarily in storage. Even if you don’t invest in home staging, you will have to declutter your rooms to optimally showcase your home’s features. If you don’t have adequate space to store the clutter, storage may be necessary. Temporary Home. If you’re moving but haven’t yet organized permanent accommodation at your new destination, you may initially require certain household goods to be stored temporarily while you’re in your short-term accommodation. If you’re moving into a fully-furnished rental, you’ll need to find appropriate storage for all your furniture and the majority of your household items. All items that you aren’t utilizing on a daily basis will need to be placed in a secure storage facility. Downsizing. If you’re moving to a new home or apartment that is smaller than your current home, you won’t have adequate space for your collection of furniture, household items and other belongings. 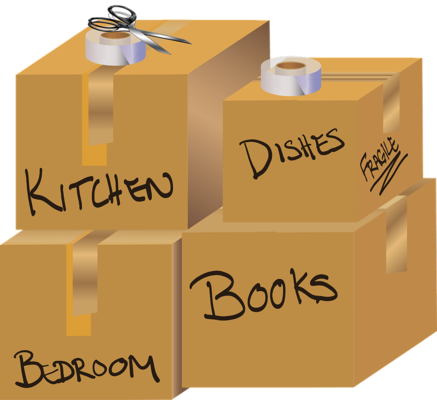 Part of the moving process will involve sorting through these belongings to see which items you want to take with you and which items you no longer want or need and are ready to part with. The items you don’t want can be given away to friends and family, sold online or at a garage sale, or donated to a local charity or family in need. However, as you sort through your belongings you will inevitably come across some or many items you want to keep but unfortunately don’t have space or use for in your new home. These items may include furniture, antiques, pianos, exercise equipment, fine china, artwork, important documents and other valuable or sentimental items. You will need to find a suitable storage facility you can trust to keep these items as safe and secure as they would be if they were in your possession. If your company is moving to a smaller office, you may need to store certain equipment, office furnishings, electronics, fixtures or documents in a storage facility. Even if you are moving to an office or facility of the same or greater size, you may want to utilize premium office space more effectively by placing important but inactive files and records in storage. Expanding or renovating your home or office is an exciting but often time-intensive and labor-intensive process. One of the many preparations required is clearing out the rooms where work will be completed to ensure that your belongings are safe and secure during the renovation process. This requires that furniture and other items be temporarily placed in a local storage facility. Do you have limited storage space? If you feel your home is filled with so much “stuff” that your living space is no longer functional or enjoyable, finding a suitable storage facility can be life-changing. Invest time into sorting through your belongings and identifying things you no longer want or need. Challenge yourself to get rid of these items. Any items that you want to keep but don’t have space or use for should be placed into a secure storage facility. If you’re moving abroad but intend to return at some point in the future, you may want to place belongings of monetary and sentimental value that you can’t bring along with you in a secure storage facility. That way, you can have peace of mind that they are secure in your absence. Access. One consideration when determining the type of storage facility is how often you need to access the items placed in storage. Cost. It’s obviously important to consider the cost of the storage options you have available. While it’s natural to prefer the least expensive options, it’s important to consider the quality of storage provided. Remember – you get what you pay for. Security. Depending on what you’re placing into storage, the level of security provided at the storage facility may heavily impact your decision. The greater the value – sentimental or monetary – of the items you’re storing, the more important security becomes in the process of selecting a storage facility. Size. Your storage facility selection may also be influenced by the quantity of the items you wish to place in storage. It is important to find a facility that allows you to rent a space that accommodates your belongings – no smaller, no larger. Climate Control. Another consideration when selecting your storage facility is whether or not your items require a stabilized climate. The following items benefit from being in climate-controlled environment: antiques; cosmetics and toiletries; art and collectibles; goods and furniture made of leather, wood or metal; important paperwork; media and electronics; photography; medications and medical supplies; wicker; bicycles and musical instruments. There are two main types of storage – self-storage and containerized storage. If you’re in search of a suitable storage facility, it is important to understand the differences between these types of storage so you can make a decision based on your unique needs. Also known as self-service storage or mini storage, self storage is an industry in which storage space or "storage units" is rented to tenants, typically on a short-term basis. Both individuals and businesses can utilize self-storage for their storage needs. and individuals. Self-storage units are secure but not contained. Items moved into self-storage facilities aren't monitored, so be aware that adjacent units may contain hazardous materials or be infested with bugs. You may not be able to purchase adequate insurance. Most self-storage facilities only offer tenants the ability to purchase a minimal amount of coverage. Most self-storage facilities don't mail out monthly invoices nor do they send out emails until the due date deadline just before late fees are applied. These facilities charge a move-in administration fee and typically increase their rates after the first few months of storage. Units at self-storage facilities come in various sizes. Tenants can only hope that they select an appropriate-sized unit and some tenants end up paying for more space than they require. Others end up with an inadequate space and have to rent an additional unit to accommodate their needs. The square foot rental cost is higher for smaller units. Exterior units can encounter problems during cold winter months. Because movers remove their blankets and protective materials once they reach their destination, your furniture and stored items are more likely to get bumped and bruised. While there are numerous concerns when it comes to self-storage, the benefit is that tenants are able to access their storage boxes and containers on a whim, seven days a week. If you require this type of instantaneous access to your belongings and are less concerned high-level security, self-storage may be a suitable option for you. When items are placed in containerized storage, all furniture is blanket wrapped and remains blanket wrapped until it is safely removed from storage. At All Jersey Moving and Storage, all items in storage are packed away in large wooden containers which are completely sealed and secure. Wooden containers are the optimal environment for such items as furniture. Full value coverage can be purchased to properly insure the goods you are placing in storage and give you peace of mind. All movement into and out of the storage facility is managed and monitored by our team. This allows us to assure tenants that there are no hazardous materials or infested shipments under our roof. Tenants only pay for the amount of space they use. Rental fees are stable, so you don't have to worry about your storage expenses increasing after a few months. All Jersey Moving and Storage also charges no move-in administration fees. If you do need to access your storage container, warehouseman at All Jersey Moving and Storage are onsite to assist you. The only restriction of containerized storage is that because stored items are sealed and secured, access must be scheduled during regular business hours and a fee will apply. Whether you're in between homes, renovating your home or office, or simply need a place to store your extra "stuff," All Jersey Moving and Storage can help. We offer reliable, convenient, residential and commercial short-term and long-term containerized storage, document storage and logistical services. When you're searching for a moving and storage company, you want to find a facility that you can trust to keep your items secure and in excellent condition. Our top priority is ensuring that your items are safe and protected, from the time they arrive to the moment they are delivered to your home or office. Our team takes every step necessary to give you peace of mind that your goods and furniture are professionally wrapped and safely packed away until you're ready to access them. At All Jersey Moving & Storage, your furniture and valued items are sealed and secured in large wooden containers as well as blanket wrapped to keep them safe. Movement into and out of our storage facility is closely monitored to ensure the safety of each container stored with us, and you can purchase full insurance coverage for additional peace of mind. With stable rental fees and no move-in administration fees, the All Jersey Moving and Storage warehouse facility is a cost-effective, reliable choice. If you're looking for a moving and storage company, you can trust that your furniture and goods are in good hands with All Jersey Moving & Storage. Contact us today for more information. Check out our movers’ top tips for preparing for storage!